St. Ninians Isle beach is a large natural sand causeway with sea on either side. On the west coast of Shetland, it links the South Mainland with the Isle. St. Ninians Isle beach is a large tombolo (a natural sand causeway with sea on either side) on the west coast of Shetland, linking the South Mainland with the Isle. It is easily accessible from Bigton, the nearest township. 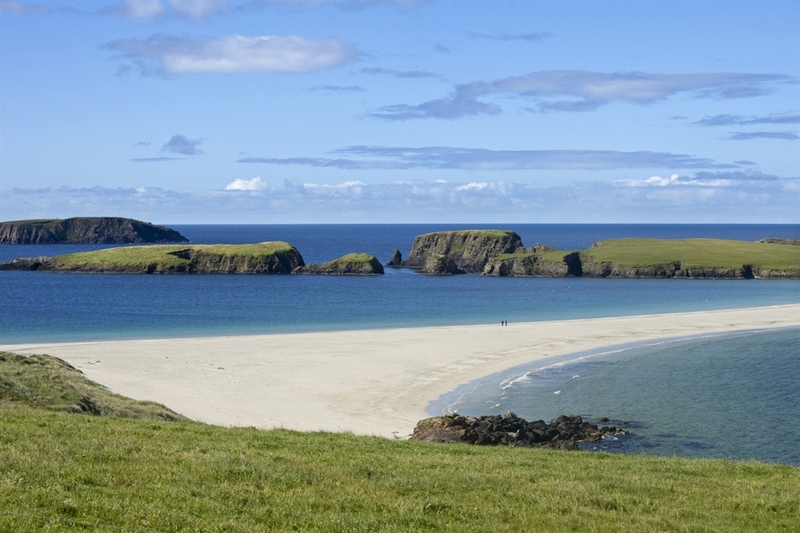 The beach itself is picturesque, often featured in promotional material and photographs of Shetland. The beach is in a rural farming region, with an archaeological site located on St. Ninians Isle. On the A970 from Lerwick to Sumburgh turn on to the B9122 towards Bigton. This is a single track road with plenty of passing places. After approximately one and a half miles, take the second right turning into Bigton. Follow this road for approximately 500 yards, where there will be a turn off to the left, then turn right immediately afterwards. This road leads to St. Ninians Isle Beach. 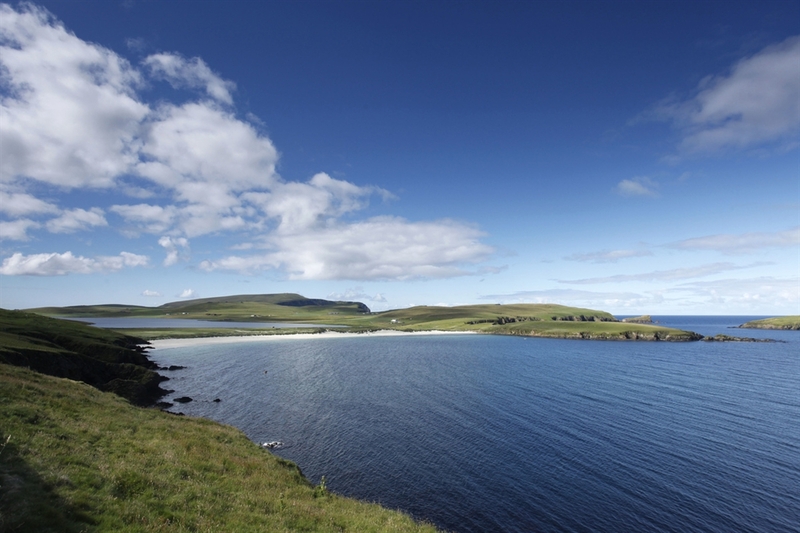 The beach is part of a core path plan for Shetland, information about which can be found at the local Visit Shetland office in Lerwick. The bus service between Lerwick and Sumburgh has one daily route (Monday to Saturday) for Bigton, which operates by way of a feeder service to/from the Channerwick Junction. 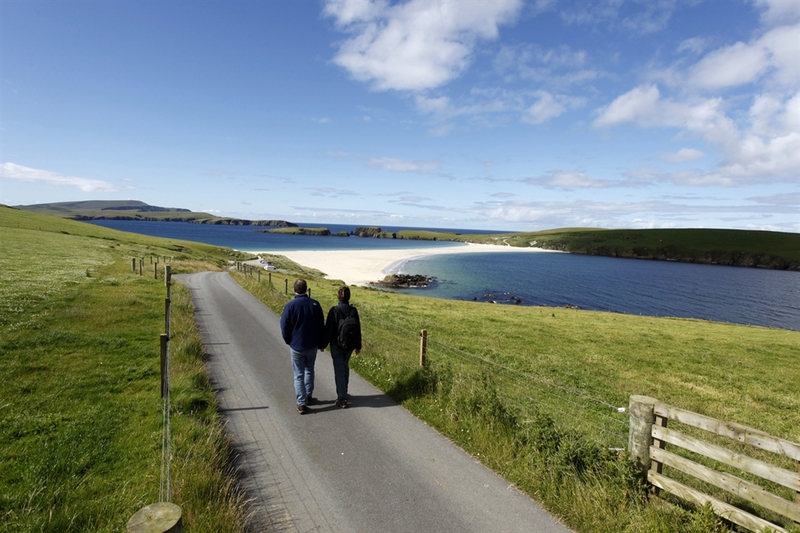 The beach is part of a core path plan for Shetland, information about which can be found at the local Visit Shetland office in Lerwick. VisitScotland / Paul Tomkins, all rights reserved. St Ninian's Isle, joined to Mainland by a tombolo of sand at Bigton, Shetland. VisitScotland / Paul Tomkins, all rights reserved. St Ninian's Isle, joined to Mainland by a tombolo of sand at Bigton, Shetland. VisitScotland / Paul Tomkins, all rights reserved. St Ninian's Isle, joined to Mainland by a tombolo of sand at Bigton, Shetland. VisitScotland / Paul Tomkins, all rights reserved. St Ninian's Isle, joined to Mainland by a tombolo of sand at Bigton, Shetland.